eCube Programmable embedded micro controller. Do you need a full facility control system that your budget simply can't allow? The beauty of the eCUBE controllers is that they can be used to automate certain aspects of your processes now. When you implement a centralized control system in the future, the eCUBE controllers can easily be incorporated into it due to their inherent network capabilities. Simply put, the eCUBE is a compact control device with enough processing power and on-board I/O to handle virtually all local area control requirements. The versatility of this small unit is unparalleled in the controls industry. While the built-in user interface defines the unit as a perfect solution for dedicated equipment control, the inherent network capabilities also make it a viable solution for plant-wide distributed intelligence designs. The eCUBE can be purchased as a raw controller or in prewired standard packages. Signal conditioning boards and I/O modules are also available to allow the unit to monitor and control all industry standard digital signal levels. Want to program it yourself? The inherent funconality of the eCUBE operating system dramatically simplifies program development requirements. Simple method calls are provided to handle low-level tedious tasks (analog value scaling, screen posioning, etc...). -Full interface capabilities to communicate with a central control system. - Remote master/slave process control from a central control system. -Capability to detect a central control system failure and temporarily retake control of the local process. -Support for flow switch, pump current, or pressure transducer-based flow regulation. -Full support of standby pump operations. -Proportional VFD or Standard ATL pump control. -Sequential staging of up to 3 compressors locally. -Digital safety or full analog sensor-based control. -Compliance for staging directions from a central control system. -Support for all valve group configurations. -Time or frost sensor-initiated defrost cycle. -Local NH3 level monitoring (requires sensor). -Proportional VFD or Standard ATL fan control. -Fixed or floating head pressure control. -Multi or single speed staged ATL or proportional VFD fan control. -Water pump and level integrated control. -Inlet and Outlet temperature monitoring-based control. 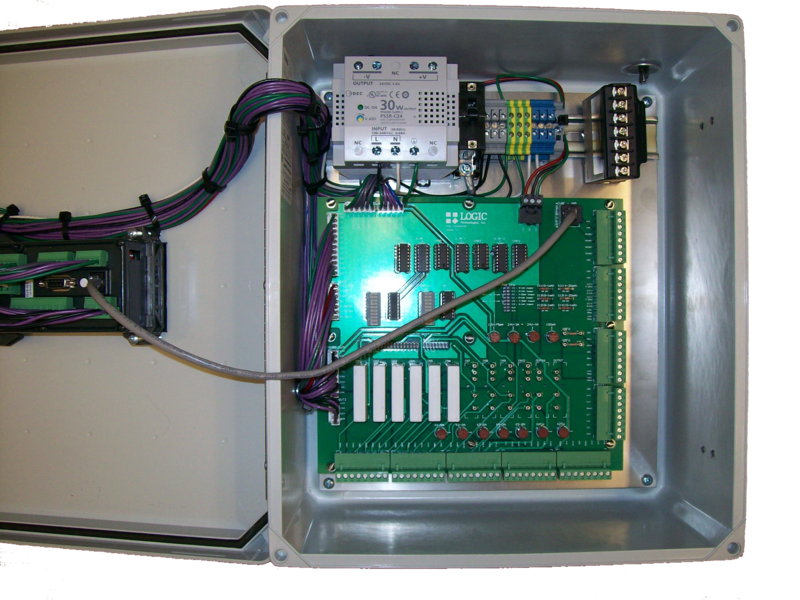 -Standalone complete HVAC unit control. -Motorized valve or damper control.